High tide already floods the bike path through Bothin Marsh in Mill Valley. I wrote and photographed a piece for the current issue of Marin Magazine about the projected effects of climate change, most specifically sea-level rise, on Marin County. Marin, like much of the San Francisco Bay Area and other parts of California, faces a wetter future. If current temperature and sea level trends continue through the century, routine tides could be as much as 55 inches higher than they are today and even higher during storm surges. 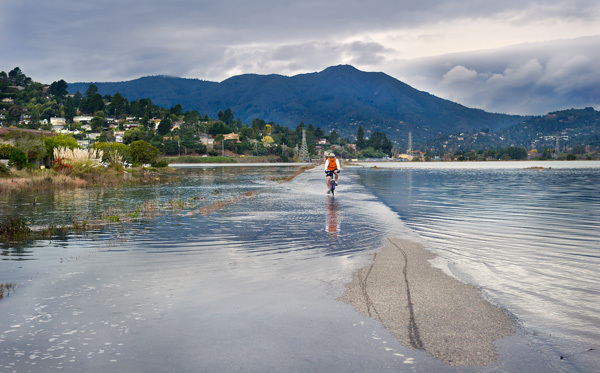 Imagine the affect of four-and-a-half feet more water on coastal communities such as Mill Valley, where today’s highest tides already flood city streets, marshes and recreation areas. The bike rider above is crossing Bothin Marsh between Mill Valley and Sausalito, which is already inundated several times a month by winter tides. If what scientists predict comes to pass — and some form of it will despite all of today’s “green” mitigation efforts — rising seas are going to change the way we live and extract severe financial and social costs. Here is the opening section. The rest is below the jump (or here online). On the winter days when the monthly tides are highest, you can stand on the narrow, asphalt ribbon of the bike path that traverses Bothin Marsh in Mill Valley and watch the water of Richardson Bay climb over the man-made banks and rise slowly, inexorably, until its cold wetness reaches your shins. You are no longer on dry land. You are in the middle of the bay. Flash forward to the year 2100. The earth has had 88 more years to warm up, and the seas have been rising a little more every year. Your grandkids stand in that same place on the marsh and wait for high tide. When it comes, the water flows over their heads. That’s climate change. That’s the threat Marin County faces — higher seas, bigger tides and stronger waves that could drown the marshlands of Mill Valley and Novato, flood neighborhoods built on reclaimed land in Tam Valley, Santa Venetia and Hamilton, and erode the coastal bluffs of Bolinas. The mess that rising seas could make of Marin is but a small part of the larger challenge climate change presents to the planet. But this story is not about the global effort to regulate carbon emissions, not about the national yammering of politicians, preachers and scientific professionals about why the earth is warming (is it man, is it nature, is it a vengeful God delivering payback for our profligate ways? ), and not about whether the earth is in fact getting warmer. The mercury is rising and the oceans along with it. This story is about Marin County and how a lot of people here are trying to make sure that come the day when the waters of San Francisco Bay — which have already risen 8 inches in the last century — are lapping at the doorsteps of homes and businesses now hundreds of feet from shore, that the inhabitants of that warmer, wetter future do not ask of our generation: Why didn’t they do something? Indeed, the county and seven cities (Mill Valley, Larkspur, Ross, Tiburon, San Rafael, San Anselmo and Novato) have adopted plans to confront climate change. For the most part, these strategies focus on reducing greenhouse gas emissions and determining risk. They have bred sustainability committees, hybrid vehicle purchases, amended building codes that force greener development and, in general, greater encouragement of public and private energy conservation. In the parlance of the climate change community, these types of actions are called mitigation and are intended to shrink Marin’s energy footprint, which, like that of other affluent communities, is sizable. In Marin, we love our Land Rovers, our exotic vacations and our big houses, but they exact a hefty environmental price — an ecological footprint of about 27 global acres per person. That’s how much land and sea is needed to produce the resources each of us use. The U.S. average is about 20 acres, and the world average is 5.4 acres, according to a 2006 report by the county Community Development Agency. Transportation alone accounts more than half of Marin’s greenhouse gas emissions. Mitigation helps, but it’s not enough. Going green alone will not save us from getting wet. Even if we abandon all of our Beemers today and buy bicycles tomorrow, in the years to come the residual impacts of the carbon already in the atmosphere will continue to warm the planet for decades, up to 11 degrees Fahrenheit more by 2100. For Marin, this warmer world could mean less rain (and drinking water supply and irrigation for our $50 million-a-year agricultural industry), flooded wetlands (drowned ecosystems) and fewer fogbanks off our coast (dead redwoods). However, that all pales in comparison to what sea-level rise — with its higher tides and bigger, more destructive waves — could do to a county bordered on three sides by a bay and an ocean that is forecast to rise 16 inches by mid-century and 55 inches by 2100. The extent of that hazard is vividly visible on maps contained in the BCDC’s latest regional climate change report, Living With a Rising Bay. Bright blue swatches (for 16 inches) and darker blue ones (for 55 inches) mark what is termed in the dispassionate language of planners as “inundation zones” — flooded areas that extend through large low-lying swaths of Tam Valley; Mill Valley from Bothin Marsh to Sycamore Park; Santa Venetia East San Rafael and the Canal neighborhoods; Hamilton, Bel Marin Keys and Vintage Oaks in Novato: as well as parts of Tiburon, Belvedere, Strawberry and Paradise Cay. A 16-inch rise of San Francisco Bay would affect more than 80 percent of this area, much of which is landfill and most of which coincides with the current 100-year flood zone. By 2050, says BCDC, this “current 100-year flood plain will be subject to flooding from not just a 100-year flood, but from a high tide.” In other words, the daily high tide in 38 years will be as destructive and disruptive as is now the 100-year flood. The Pacific Institute, an Oakland-based environmental think tank, estimates that Marin’s inundation zone contains 228 miles of roads, including parts of Highways 101 and 37; sewage treatment plants; water lines; and, of course, hundreds of homes, businesses and other structures whose replacement value the institute puts at $8.5 billion. These figures don’t include additional damage along Marin’s Pacific Coast, from the already deteriorating cliffs below the Bolinas mesa to the delicate tidal ecology of the Bolinas Lagoon and the multimillion-dollar homes fronting the sandy strand of Stinson Beach. The Pacific Institute enumerates 27 miles of roads at risk there and $260 million worth of property endangered. LaClair, the BCDC planner, agrees, but also points out that current levees won’t be much match for seas at the end of this century. “Fifty-five inches tends to overwhelm any of those shoreline protection devices,” he says. Second, there is time to prepare, a process that the county and the local cities are dividing into three steps — mitigate, investigate and adapt. Mitigation is under way, as outlined in the various local climate change action plans (which are available online). Investigation is just beginning and involves county and city planners doing boots-on-the-ground assessments of specific local risks, using broader estimates of regional agencies such as the BCDC and the Pacific Institute as starting points. They want to know: What exactly is in the water’s path? What protections, such as levees, are in place? Which levees are endangered? Where are new ones needed? Which marshes can “retreat” inland to escape rising bay waters and which might be blocked by existing development? Can some developed areas be sacrificed to the tides? The list of questions is endless; the number of answers thus far almost nil. 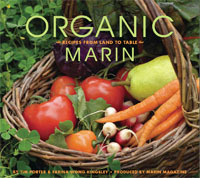 Eventually, answers will emerge and from them will come step three of Marin’s response to climate change, the most difficult and the most expensive — adaptation. Adaptation involves building some things (such as the 130 miles of levee construction and fortification and new seawalls the Pacific Institute foresees Marin needing), moving other things (roads and pipelines that carry our water and sewage) and embracing new standards of living, such as living in smaller houses and using public transit, that value conservation of energy over convenience. What all this will cost is unknown. No Marin official wants to hazard a guess, and who can blame them? We live in a time when municipal budgets are anorexic, when the state approaches the brink of bankruptcy annually and when a national political zeitgeist characterizes what should be serious questions of public policy as just more bones to be tossed into an endless political dogfight. It’s hardly an atmosphere amenable to allocating billions to protect our cities and natural habitats from flooding. The Pacific Institute provides a peek under the financial tent in its 2009 report, The Impacts of Sea-Level Rise on the California Coast. It estimates that the 1,100 miles of levee and seawall work needed to protect coastal and bayfront lands statewide will cost $14 billion, with nearly $1 billion of that in Marin County alone. That’s a conversation Supervisor Kate Sears very much wants to have. Sears not only is Marin’s representative on the BCDC, and therefore deeply involved in the regional climate change discussion, but her supervisorial district also encompasses Southern Marin communities that face some of the greatest challenges from sea-level rise — Mill Valley and Tam Valley. Sea-level rise, he says, “has to become a priority for people in order to elevate the level of concern to the point where [they] are willing to commit funding to it.” In the Bay Area, LaClair thinks that will happen as the earliest significant impacts of climate change appear. One person who doesn’t need convincing about sea-level rise or the urgency with which it should be addressed is Alan Jones, an architect and a member of the Tam Valley Gateway Coalition, a neighborhood group that has met with Sears, Crawford and other county officials about the impact of climate change. For a mild preview of what sea-level rise is capable of, visit the junction of Shoreline Highway and Highway 101 when the king tides — the highest tides of the month — arrive in December, January and February. There you’ll see cars driving through bumper-deep saltwater, parking lots awash, and, if a winter storm is creating a tidal surge, Miller Avenue in Mill Valley underwater and closed, effectively turning the apartments and condos that line Bothin Marsh across from Tam High into temporary islands. There is a bit of ironic reasoning that can be applied to sea-level rise. It goes like this: Man imposes himself on nature and fills in much of the bay, then uses the reclaimed land to drive development that eventually warms the planet to such a degree that the seas rise and take back the land we took from nature. Payback can be brutal. This entry was posted in On the Job and tagged BCDC, Bothin Marsh, climate change, Greenbrae Boardwalk, Joe LaClair, Kate Sears, Marin, Marin Magazine, Pacific Institute, Sausalito, sea level rise, Tam Valley.